HIIG is a publicly and privately funded independent research institute whose work complies with scientific quality standards and transparency rules. The founding partners – the Humboldt Universität zu Berlin, the Berlin University of the Arts (UdK) and the WZB Berlin Social Science Center, along with its integrated cooperation partner the Hans-Bredow-Institut for Media Research in Hamburg – established the institute through a donor pledge by Google, in order to develop multifaceted perspectives that shed light on technological, legal, social, economic and creative issues regarding the internet. The governing body of the institute is the Foundation Internet and Society comprised of the founding academic institutions as permanent members of the foundation board. Over time, the institute has been further funded and supported – next to the initial and ongoing financing by Google – by additional sponsors and partners (e.g. CISCO, KPMG, innogy foundation for energy and society or the VolkswagenStiftung) as well as by public third-party funding, e.g. the Federal Ministry for Education and Research and the Federal Ministry of Economy. 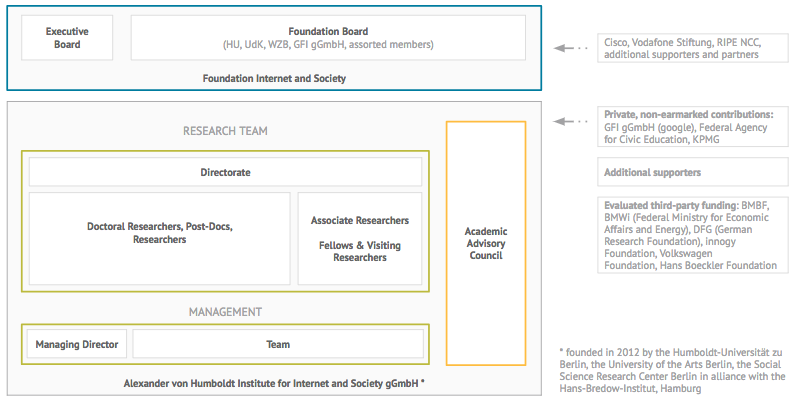 The Foundation Board, comprising founding partners and well-known personalities from science and society, supervises the structural and strategic development of the Foundation Internet and Society. The Executive Board officially represents the Foundation Internet and Society. Two academic directors of the HIIG gGmbH form the current Executive Board: Prof. Dr. Dr. Thomas Schildhauer and Prof. Dr. Wolfgang Schulz were appointed as chairmen. The Advisory Council advises the research agenda and critically evaluates the thematic focus of the institute and thereby helps to ensure the independence of the research. Next to the Advisory Council an ombudsperson has been elected, who is a contact person for employees and researchers of the HIIG based on the suggestions for safeguarding good scientific practice at HIIG. The scientific lead of the institute is determined by the academic directors, who represent the various scientific disciplines. They design the research agenda of the institute, arrange joint research projects and scientific events. The academic directors elect a speaker, who represents the institute on scientific matters to the wider public. They are supported by an administrative management team. Prof. Dr. Jeanette Hofmann is elected speaker of the HIIG. Managing director is Dr. Karina Preiß.